OMG. 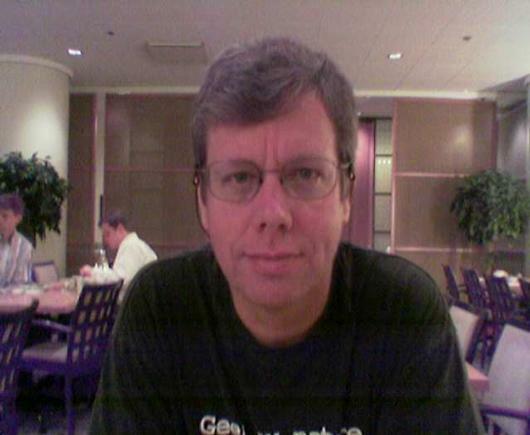 I met Guido van Rossum this morning. Guido is the father of python, my favorite only programming language. He was in Helsinki meeting with the Nokia folks working on python Symbian phones. He will be talking to developers later today. I have a long history with python. The Ultraseek search engine by Steve Kirsch at Infoseek was written in python and many of the people in Digital Garage which I was co-CEO of at the time were developing the Japanese version and working in python. Later, Cyrus et al at Digital Garage use Zope, a python package to build a commerce site. More recently, I learned python using Dive Into Python by Mark Pilgrim as my tutorial and I wrote the first useful script in my life, Technobot. In the process of writing the script, I went for help on #python on Freenode which regenerated my interest in IRC and led to the birth of #joiito. I owe a lot to python and therefore to Guido. So thanks! What? You met Guido and all you did was take a picture? If I was meeting Guido, I'd fall at his feet and offer my firstborn. Heck, even that wouldn't be good enough. Joi Ito - "Breakfast with Guido van Rossum" by Joi Ito is licensed under a Creative Commons Attribution 4.0 International License.